Dinosaurs, prehistoric animals that appeared about 230 million years ago, have long captured the imagination of people since their fossils were discovered and recognized in the 19th century. They have been subject to many books and movies, Dinotopia, and Jurassic Park being the first two that comes to mind about the depictions of dinosaurs in popular culture. My favorite comic strip, Calvin and Hobbes, regularly feature the prehistoric beasts. Even that annoying purple animal on morning TV helped popularize the animal to kids. Like most people, I've been fascinated with dinosaurs since I was a kid. I've read about them in books and seen them on television and on movies, albeit with inaccurate depictions. The first time I saw a full-size replica of a Tyrannosaurus Rex was in the Mind Museum in Manila, and that was already pretty exciting to me. Imagine how excited I would be if I stumbled in a museum where a there's a whole floor devoted just for them. 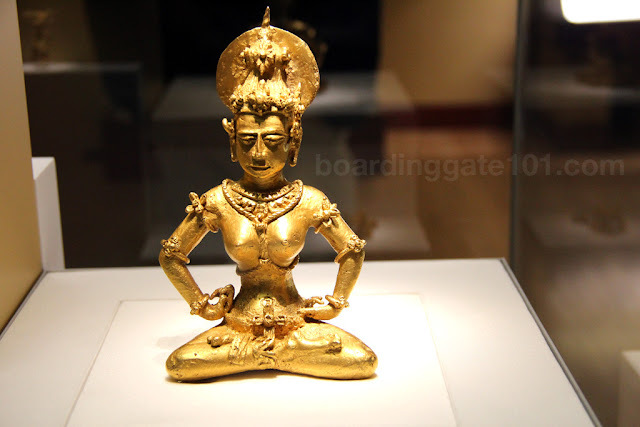 That's what just happened when I visited the Field Museum in Chicago. 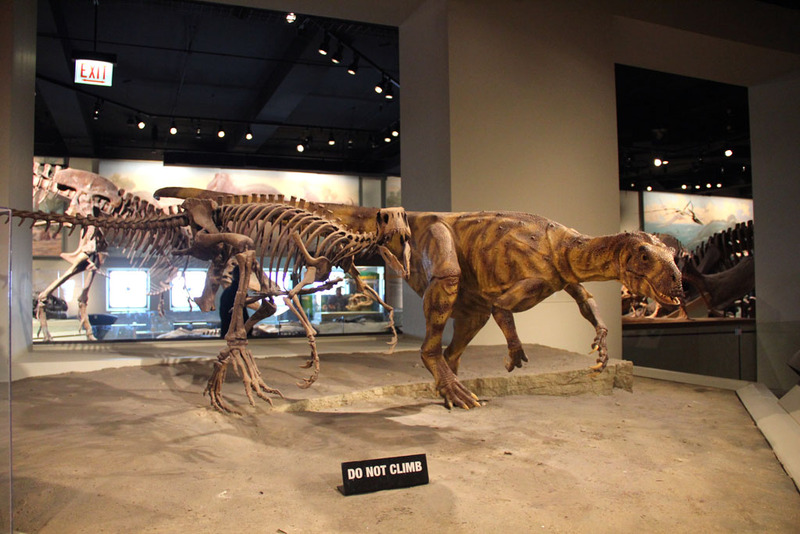 As part of the Evolving Planet exhibit, the section that creationists and intelligent design supporters probably hate the most, the dinosaurs are housed in the Dinosaur Hall, in the upper level of the museum. Most of the dinosaurs on display were from the Cretaceous period (145 million years ago), but some are from the Jurassic period (200 m.y.) 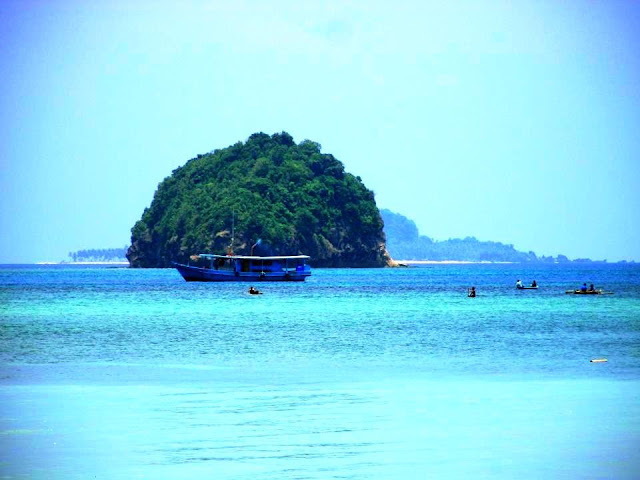 and Triassic (251 m.y.). 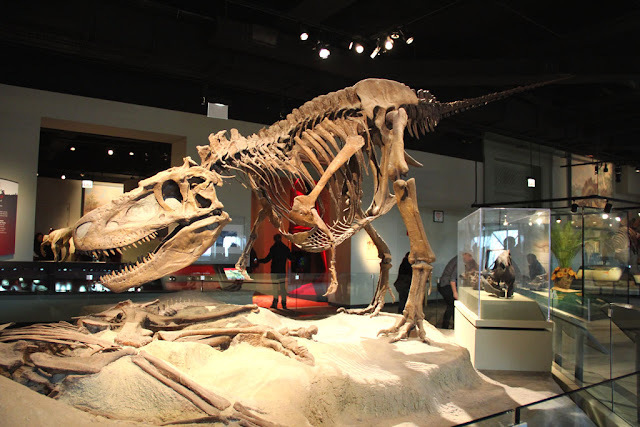 Of course you'll get a preview of what's on the upper level as you enter the museum, as Sue, the most complete T. rex skeleton ever found, is on display there, poised menacingly and ready to pounce on a prehistoric prey. 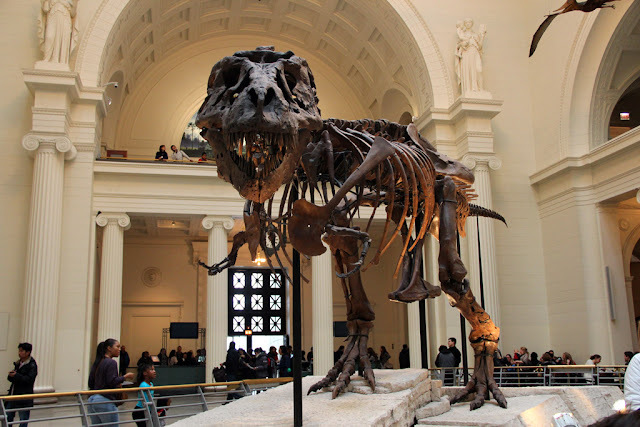 The T. rex existed in the Cretaceous period. 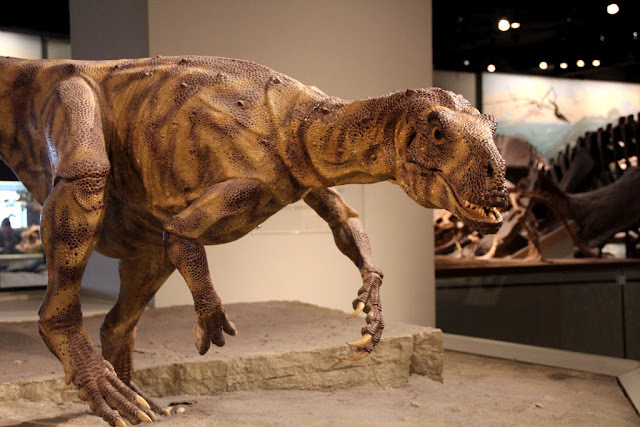 You have to navigate the exhibit that encompasses 4 billion years of evolution, from single-celled organisms to plants to early reptiles, before you enter the Dinosaur Hall. 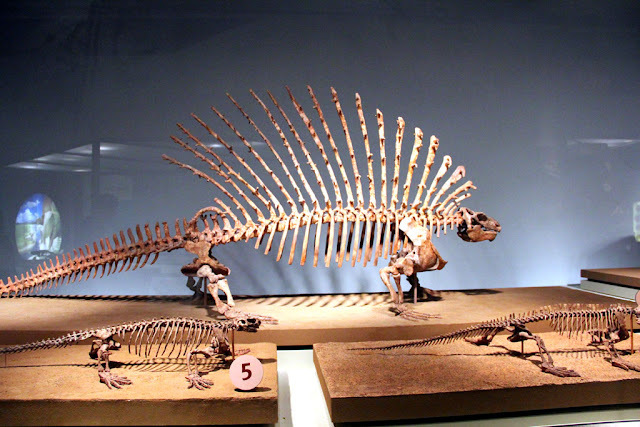 Before you get there you'll see a specimen of a Edaphosaurid, a tetrapod that lived in the Permian era, about 290-248 million years ago and precluding the dinosaurs. 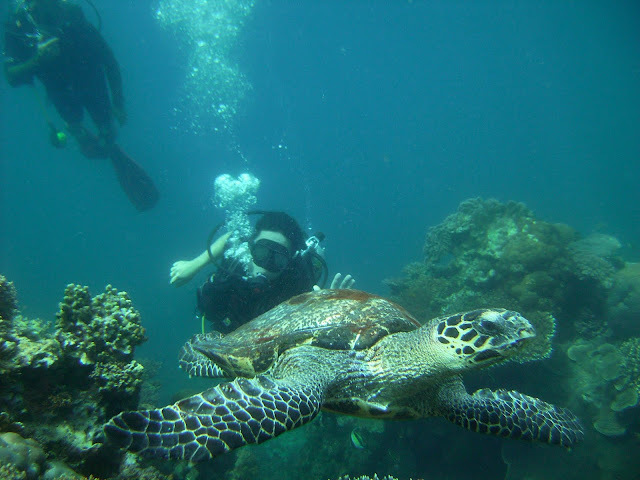 Edaposaurids have long spines running along its back and are probably herbivorous. At the entrance is the cast and model of one of the earliest dinosaurs ever found, the Herrerasaurus. 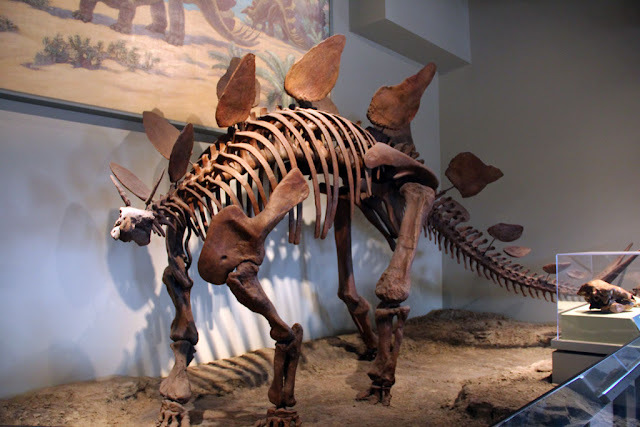 The dinosaur was named after the Argentinian goatherd who found the fossil in 1959. Herrerasaurs existed during the Triassic period, and are about as tall as a human's waist. 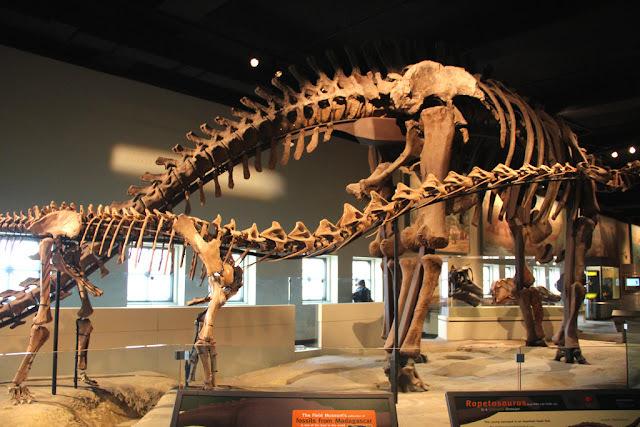 Looming over the hall is the skeleton of a juvenile Rapetosaurus, which is a kind of a sauropod. The massive sauropods have the characteristic long necks and pillar-like legs. Rapetosaurs, which can grow up to 15 meters tall, lived in Madagascar about 65 million years ago. Archaeopteryx, an early bird. It probably caught a worm too. It is kind of overwhelming to see so many dinosaurs at once, and all in the same place. It is like compressing 300 million years of prehistory and seeing them at once. Moving from one skeleton to another, I see some familiar ones, like the Stegosaur (third photo from top). Stegosaurs are herbivores and have distinct "plates" running along its spine. 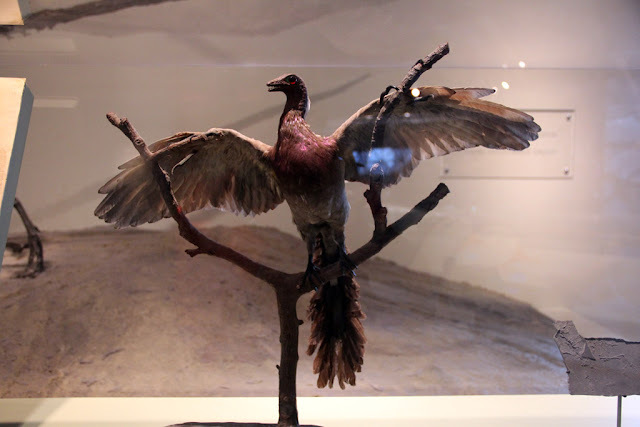 I've also seen a cast and model of the Archaeopteryx, an early type of bird. Alongside it are the skeletons of the Compsognathus, its relative. 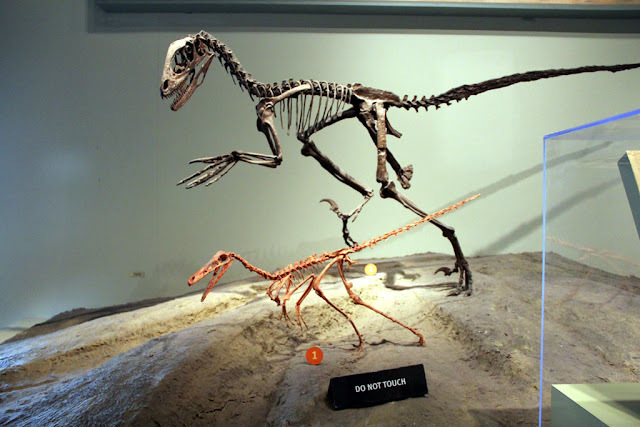 The Compsognathus is the size of a chicken. One fascinating display is the skeleton of a Daspletosaurus, a relative to the T. Rex and also an apex predator. 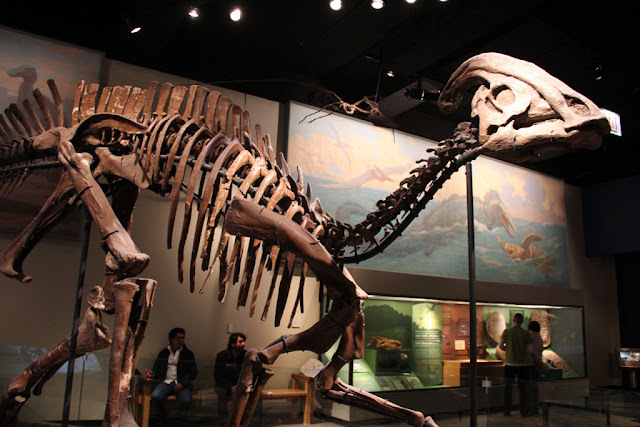 The skeleton was mounted in such a way that it towers over the bones of a duck-billed dinosaur, probably a prey to the tyrannosaurid. There's another duck-billed dinosaur on display, a herbivorous hadrosaur called Parasaurolophus (second photo from top), which doesn't really have a bill like a duck's but rather a beak. Scattered around the mounted skeletons are fossilized bones and skulls of several dinosaur species. A thighbone of an Argyrosaurus superbus in on display in one corner. 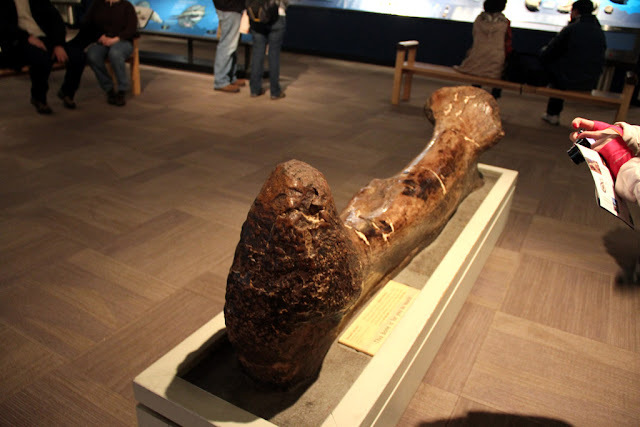 Judging from the size and length of the thighbone, the dinosaur would have stood 30 feet tall and 70 feet long! The Dinosaur Hall was definitely my favorite part of the museum, and I think it's worth a second trip if I get the chance to visit Chicago again. Nearby you can also visit Grant Park, the Adler Planetarium and the Shedd Aquarium.